Megan is a dedicated personal trainer who understands the motivational and behavioural changes required for people to achieve their goals. After gaining a Bachelor Degree in Communication from the University of Canberra, Megan’s passion for health led her to a career in public health and social marketing. Megan has been training in Canberra gyms since 2001 and began working in the fitness industry in 2006. Megan is an international level powerlifter with the International Powerlifting Federation, having competed for Australia at the 2012 and 2014 Oceania Championships and the 2015 and 2017 World Championships. 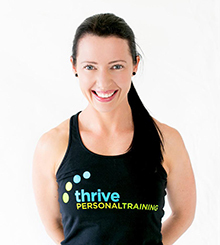 Megan is a registered Personal Trainer, Gym Instructor and Older Adults Trainer with Fitness Australia and holds a current Senior First Aid Certificate. Her qualifications include Certificate III in Fitness – Group Fitness Instructor, Certificate IV in Fitness – Personal Trainer, THUMP Advanced Boxing Instructor, Powerlifting Coach, certified Metabolic Nutritionist (MP level 1) and MP Certificate in Advanced Supplementation. 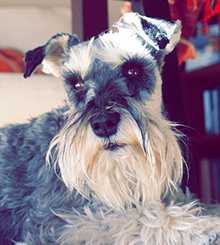 Holly Hinchley is a miniature schnauzer and a long time supporter of Thrive Personal Training. She enjoys eating, sleeping, long walks, and juicy bones. Her professional qualifications include sitting and shaking hands.